Evolutionary theory says mutations are blind and occur randomly. But in the much-debated phenomenon of adaptive mutation, cells can peek under the blindfold, increasing their mutation rate in response to stress. Scientists at Winship Cancer Institute of Emory University have observed that an apparent "back channel" for genetic information called retromutagenesis can encourage adaptive mutation to take place in bacteria. The results were published Tuesday, August 25 in PLOS Genetics. "This mechanism may explain how bacteria develop resistance to some types of antibiotics under selective pressure, as well as how mutations in cancer cells enable their growth or resistance to chemotherapy drugs," says senior author Paul Doetsch, PhD. Doetsch is professor of biochemistry, radiation oncology and hematology and medical oncology at Emory University School of Medicine and associate director of basic research at Winship Cancer Institute. The first author of the paper is Genetics and Molecular Biology graduate student Jordan Morreal, PhD, who defended his thesis in April. Retromutagenesis resolves the puzzle: if cells aren’t growing because they’re under stress, which means their DNA isn’t being copied, how do the new mutants appear? The mutation in the RNA results in a protein with augmented function that helps the cells grow, giving them a chance to replicate their DNA and for subsequent DNA mutations to exert their effects. Note: despite retromutagenesis' name, reverse transcriptase is not involved. In the PLOS Genetics paper, scientists led by Doetsch and colleague Bernard Weiss, MD provide evidence that retromutagenesis is occurring in E. coli bacteria forced to grow on the sugar lactose as their only source of energy. "Most of the previous experiments on adaptive mutation have attempted to rule out growth of the parent cells during selection, which is almost impossible to do with the necessary rigor… Instead of measuring overall DNA replication via cellular growth in the parental population during selection as in previously published experiments, we are able to gauge DNA replication specifically in the revertants via NTS [non-transcribed strand] mutations. 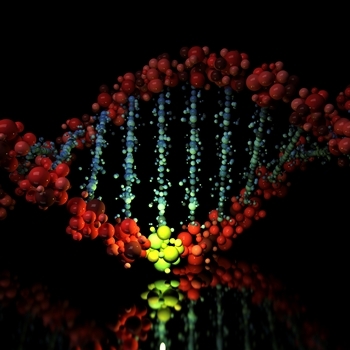 Low frequency of NTS mutations found after direct selection indicates there was little DNA synthesis before gene expression and strongly supports the model of retromutagenesis," the authors write.